While bulbs in borders can be planted throughout the autumn, bulbs in grass are planted at the end of September or beginning of October, before the grass becomes too wet. Depending on the size and nature of the bulbs, different techniques are used. Bulbs which look best in clusters are planted into grass flaps which have been dug with a spade. The size and depth of the flap is determined by the size of the bulb. 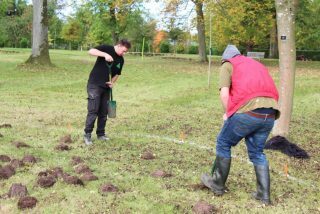 For crocus bulbs, we dig a hole of about 15 cm square and a depth of about 12 cm. 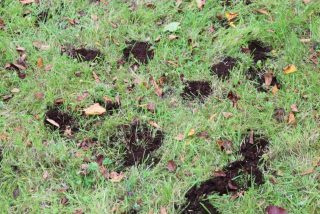 The crocus bulbs are planted in groups of 12 and covered with hot chilli powder, which, as reported in January 2017, is a very effective deterrent for rodents. The flap is closed, and more chilli powder scattered onto the surface. The surface treatment is repeated during the winter, wherever scratching by animals is apparent. Crocus planting and protection with chilli powder. Small bulbs which look better as individuals, such as scilla siberica, are planted into holes made with a crowbar. The holes are then filled back with compost. There is no need for chilli powder as Scilla bulbs do not get attacked by rodents. The greatest challenge by far is to plant large bulbs such as camassias and allium hollandicum: These bulbs which have a diameter of about 6 cm must be planted individually, at least 20 cm deep. This cannot be done with a spade or crowbar but requires an auger drill. 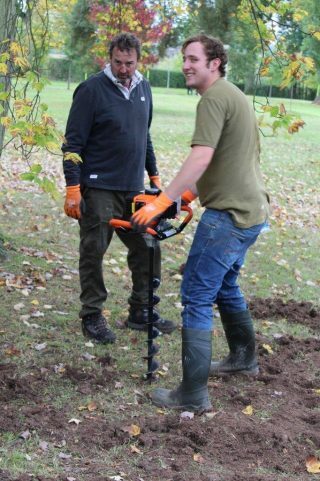 The drill is petrol-driven and vibrates very strongly, which is why it needs two people to operate it. 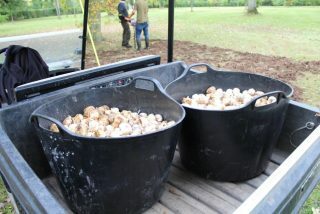 Given that we are planting several thousand of these bulbs every autumn, this is a very strenuous task!